BT Sport pundit Robbie Savage is backing Brighton's home form to keep them in the Premier League this season. Speaking after Brighton's 2-0 defeat at Arsenal this afternoon, Savage said the Seagulls' form at the Amex will be key to their chances of staying in the top flight. Goals from Nacho Monreal and Alex Iwobi took Arsenal to all three points at the Emirates but asked afterwards if Albion are good enough to stay up, Savage said: "They're home form is going to be so crucial. They've already got two wins there and have beaten the likes of West Brom and Newcastle. "It's going to be tight but I think they will, just." Fellow BT Sport pundit Michael Owen agrees home form will be key for the Seagulls. He felt the way they set up at the Emirates looked like a 6-3-1 formation at times and said: "When you come up, sometimes you have to accept there's going to be better teams. "They've come here and accepted Arsenal are better, so what can they do? Do you play fire with fire and get stuffed normally or do you play defensive. "The majority of Premier League teams that come up from the Championship think to themselves 'Right, we've just got to keep it tight and nick a goal'. "A lot of them will hardly ever score many goals but might stay up that way. I think that's Brighton's way and they might just have to rely on being a little bit more expansive at home when they play against teams around them." 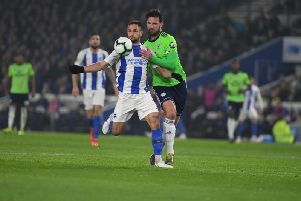 Savage added he feels Albion need more creativity going forward and said: "When Birmingham got promoted, I joined them for their first season in the Premier League. What Steve Bruce did was set us up with two banks of four and said be solid and hard to beat. "We then had that creative flair with Christophe Dugarry. You look at that Brighton side and there wasn't a Christophe Dugarry who's going to create that moment of magic although, at times, you have to carry a player like that. "Anthony Knockaert was on the bench today and he's that spark but you look in the final third for Brighton and they didn't have that much creativity."